Instagram’s new activity dashboard is now live. This is designed to help you track how much time you’re wasting on Instagram, and change your habits accordingly. That is if you feel that spending hours browsing Instagram is a problem in need of fixing. In August, Facebook announced new tools to help you fight your social media addiction Facebook Helps You Fight Your Social Media Addiction Facebook Helps You Fight Your Social Media Addiction Facebook is trying to help social media addicts by launching tools designed to help you manage your Facebook and Instagram addiction. Read More . These new tools are designed to help you manage the time you spend on Facebook and Instagram. Because we all know how easy it is to sucked in for hours at a time. Instagram’s new activity dashboard can be found under “Your Activity”. Just click on the hamburger icon in the top right-hand corner of your profile, and then click “Your Activity”. Here, you’ll see a dashboard showing you how much time you spend using Instagram. Thankfully, the tools aren’t just informative. You can set a daily reminder when you’ve been using the app for a period of time of your choosing. You can also change the types of notifications you get, and even mute notifications altogether for up to 8 hours. 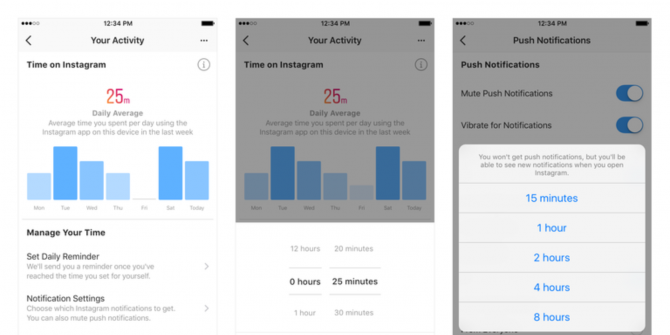 Instagram rolls out an activity dashboard that shows how much time you spend on the platform. Setting a time limit is designed to help those people who need reminding to take a break from their phone once in a while. And the option to mute notifications should prevent interruptions when you’re meant to be focusing on something more important. In its original article announcing these new activity dashboards, Facebook said it has a “responsibility to talk openly about how time online impacts people—and we take that responsibility seriously. These new tools are an important first step”. This is a good first step too, as there’s mounting evidence that social media is bad for you 7 Negative Effects of Social Media on People and Users 7 Negative Effects of Social Media on People and Users If you can't imagine your life without social media that's a sign that you've fallen a victim to the power of social networking. But what are the negative effects of social media? Read More . As with most things, it’s all about moderation, and for people who are currently unaware they’re using Instagram to excess, these new tools could be a gamechanger. Explore more about: Facebook, Instagram. What about a circle with mark but in black colour?